VIP Pipe and Drape is great addition for any show exhibition or partition for your one of the kind venue. 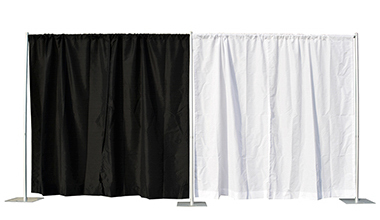 Our simple line up for pipe and drape covers most basic need for a professional display. Pipe and drape backdrops can set the stage for any event. 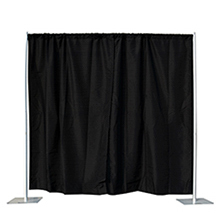 Whether you’re looking for a luxurious lining for a party, drapery to provide privacy, or a backdrop for photography,or a pipe and drape booth, VIP Crowd Control offers a wide variety of pipe and drape kits to give your event the special touch it needs. Check out our sets of pipe and drape for sale and make your event special. Our pipe and drape kits consist of only steel bases, aluminum pipes, and fabric drapes. Setting up a display is as easy as 1-2-3, and does not require special skills or tools. Our lightweight pipe and drape kits are easily transportable, and even easier to take down. VIP Crowd Control’s easy pipe and drape kits not only look great, but they save time and money by providing a quick, cost-efficient solution to your decorating needs! Whether you need pipes and drapes for a single occasion or a regular event, our pipe and drape kits can help you get the decorations you want at a price that won’t break your budget. Cheap pipe and drape sets are our specialty. VIP Crowd Control knows their event control. We offer a wide variety of pipe and drape kits and other products to help you take control of your premiere, book signing, or business event, all at competitive prices. Buy pipe and drape online and place your order today! This is the vertical aluminum pipe that decides the overall height of your booth. In the majority of cases, the finish of the upright is anodized, but black powder coated finish can be requested. The upright comes in different options: one-piece upright setup, two pieces upright setup, and adjustable upright setup. Depending on the budget and situation of the environment, everypipe and drape booth option has its own market. 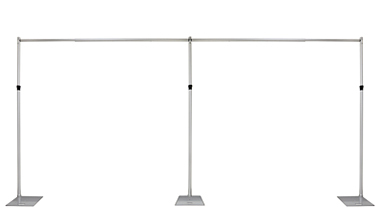 The steel base weights that come in rectangular shape are a major factor affect the stability of your pipe and drape boothsetup. 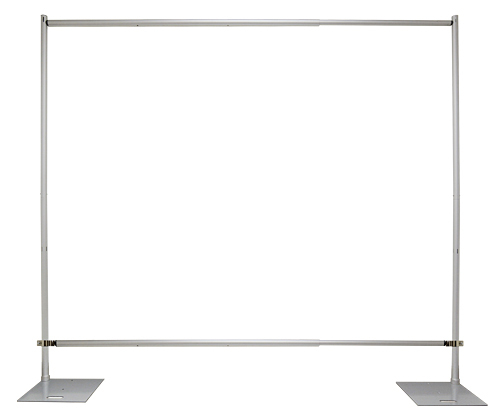 In order to be sure your pipe and drape display will not be tip over easily, a proper weight requirement on the base plate is mandatory. The higher the upright goes, the heavier the base plate is needed. This is the fabric that hangs over the cross bar to achieve the required setup for each event. There are quite a few fabric selections on the market. The opacity and the material of each fabric decide where the display is being used. 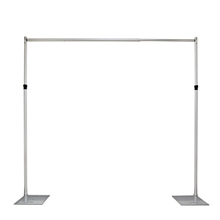 Crossbar clamp is ideal for additional crossbar support when you are looking for another crossbar to add to your pipe and drape boothsetup. Clamps provides another option to maximize the use on your pipe and drape lineup. The following table goes to the end of the page. Size 14" x 16" 18" x 18"
Looking for additional crossbar on your pipe and drape setup! These clamps work with both VIP Crowd Control fixed and adjustable uprights as another support for extra crossbar on any of the pipe and drape setup.